A need for more leadership skills and the ability to establish sustainable relationships prompted the birth of a local organization that puts a new spin on community service. Leaders Educated as Philanthropists was the brainchild of Lauren Calahan who, after teaching since graduating from college, saw three areas she could improve on in today's society. "I saw three areas that I wanted to change and they were establishing connections in an age of technology where people are always connected but still disconnected, a fear of commitment and establishing sustainable relationships," Calahan said. Even though many students in Darien are involved in some form of community service, Calahan said she wanted to see students become more involved than just doing a coat drive. "The problem is that a lot of the community service is built upon handouts and that is creating a cycle of entitlement and disempowerment. We are working on establishing partnerships based on philanthropy and we create programs based on equality," she said. One of the main objectives of LEAP is to empower participants with the confidence and to give them the tools to find creative solutions to problems. The program also offers a unique blend of participants because students who come from all different backgrounds are brought together to address a specific cause of their choosing while forming lasting friendships with each other. Even though LEAP is based in Darien, Calahan said the program is open to anyone, and participants work with students from all over Fairfield County and farther. As students work on a particular issue that resonates with them, the hope is they will gain more life skills and be more well-rounded adults as a result of their work. "We looked at the strength of this generation and I think we sometimes take for granted that kids learn leadership through osmosis," Calahan said. "We decided to teach leadership and that's why we created LEAP to LEAD." LEAP to LEAD is the entry point for participants into the program. "One of the things we found is that you can give someone a voice and they tend to fall short because they don't have the tools to be resilient. 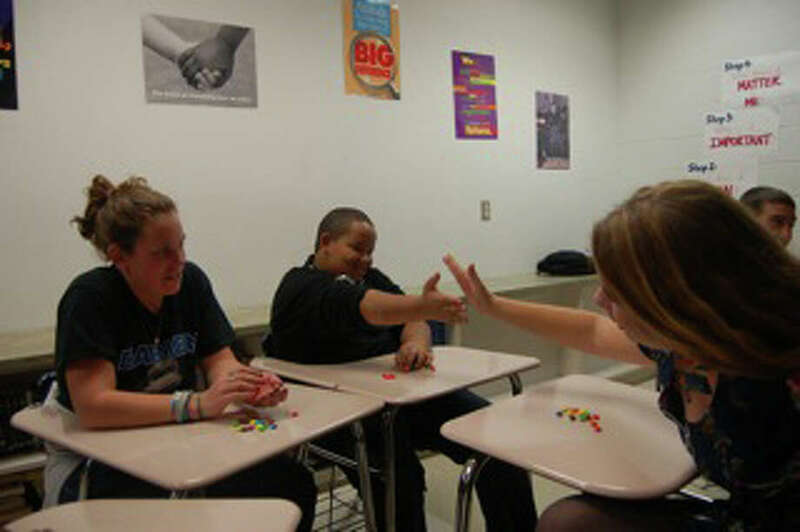 LEAP to LEAD is the only part we teach and then the students run the program," Calahan said. Kyra Gardner, who is currently involved in the program, said she joined because said one of the biggest assets of the organization is the ability to get together with people she otherwise wouldn't have the opportunity to socialize with. "Meeting everyone can be a little awkward at first, but then the tensions melts away as we break down stereotypes, and get a new perspective about the world around us," she said. Breaking down stereotypes plays an integral role in preparing participants for the real world. One of the first topics LEAP teams tackle when they meet is how they perpetuate stereotypes within their community. "We have participants identify the strengths and weaknesses in their community and the role each person plays in perpetuating those perceived strengths and weaknesses," Calahan said. "That process helps build comraderie and then they can start figuring out their vision." LEAP was started more than a year ago, and since then, some of the projects participants have undertaken have included trying to foster more drug awareness and to clean up garbage in the slums of a Nairobi, Kenya, community. Another project under way, which is being lead by students from Darien High School and Fairfield Warde High School, is to create a photo journalistic accounting of child soldiers in Uganda. The students are working on building a partnership with rescued soldiers to collaborate on ways to help families of the soldiers and the community. Even if the projects participants undertake never completely come to fruition, Calahan said it is the process everyone goes through that is more important than the end result. "We're most concerned with the process of the participants working with people they don't know and we want them to be knocked off their footing," she said. "This is a totally unique program and I want to see this program become part of the education." For more information about LEAP or to get involved, visit www.leap-edu.com.